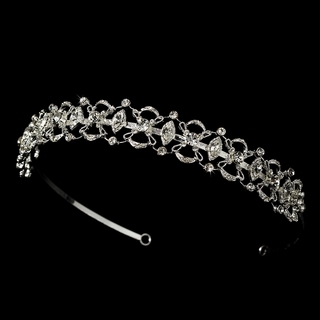 Spectacular Swarovski crystal detailing measures a generous 8-1/2" along this 15" long sterling silver-plated band. This headband measures 1" at its widest point. Pin loops are located at each end for added security and comfort. Shown with our "Sail Away" Necklace, Earrings, and Bracelet Set (sold separately).